ROYMERSWAELE, Marinus van. 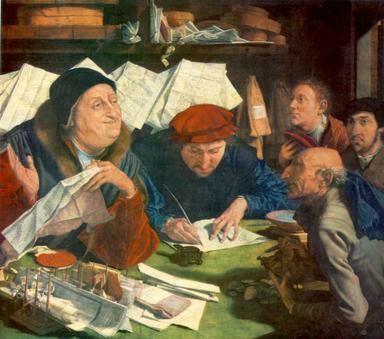 Tax Collector, 1542. Wood, 103,7 x 120 cm. The Artist Tax Deduction Bill is finally up for action. Please take the time to support this important bill as its passage will impact all individual artists. Go to the link below to send a message to your representatives and senators. Please forward this information to your mailing list! 03-19-2007: After announcing at the Congressional Arts Breakfast on Arts Advocacy Day that he would be the lead sponsor for the Artist Deduction Bill, Rep. John Lewis (D-GA) introduced the bill on March 14, 2007, joined by Rep. Jim Ramstad (R-MN). Identical to a Senate bill introduced by Sens. Patrick Leahy (D-VT) and Robert Bennett (R-UT), the bill supports individual artists by allowing them to take a fair-market value tax deduction for tangible works they donate to nonprofit collecting and educational organizations, and it benefits the public by giving them access to more art. Send a message to your members of Congress asking them to be a co-sponsor of this important bill, H.R. 1524 (House) and S. 548 (Senate).